Lonesome Lost & Foggy is excited to bring you their first recording. Pittsburgh's own bluegrass band has been working for the past 9 months do record, master, and produce this 7 track album full of great originals as well as traditional bluegrass songs. 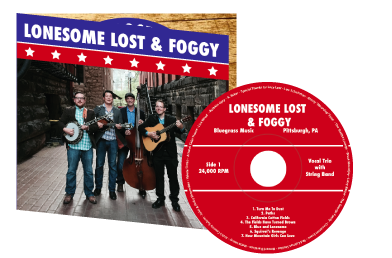 Recorded at Red Caiman Studios in the bustling dahntahn (downtown) Pittsburgh, Lonesome Lost & Foggy poured their hearts into creating a selections of songs that will tug at your heart strings and make you dance in your britches. Physical copies will be available for sale at upcoming gigs for $10!